Log home refinishing has changed over the years because of the changes in the products used. 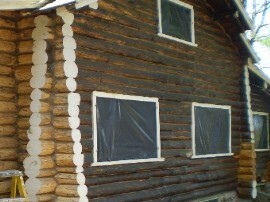 We get asked at least a few times a month about the advantages of oil based vs. latex based stains on log homes. This seems to be the “age old debate” in the log home community. In brief, we recommend the latex based stains when finishing your log home and here is why. About ten years ago, the EPA made a set of rules that are effectively going to make oil stain a thing of the past. The rules have been phased in. The companies that make log home stain have been putting all their research and development efforts into the “next generation” latex stains. These are stains that contain latex based pigments. Notice the contrast between the darkened logs and the crowns that had already been blasted to remove the built up finish. The oil based stains are still around mainly because they continue to sell and many people still swear by them. The reality is that the stain companies will have to change them significantly to comply with current environmental law. Another drawback of the oil-based stains is that some oil stains have a problem with “buildup”. These film-building stains can build up to the point that they can cause problems with rotting logs. The new latex stains are lasting longer and longer and they lack the buildup problems that oils have. These are two reasons why the scales have tipped for us to the side of the latex based stains. There is still no magic bullet for semi-transparent stains. The reality is that you need to keep up with a re-coat schedule on your house. It is our opinion that when it comes to log home refinishing… we recommend using latex stains.